Erwin Lutzer's book helped thousands grasp the healing power of forgiveness. Now on DVD, the message is even simpler to apply in real life situations.Bitterness is a self-inflicted wound. By choosing not to forgive, we voluntarily sentence ourselves to diminished, pain-filled lives. Why would anyone do such a thing' Because forgiveness seems an inappropriate response to offense. Painful, personal wounds cry out for justice. But what if justice is not possible' Or if it doesn't undo the damage done' In this DVD series of lessons, noted pastor and author Erwin Lutzer carefully illustrates how it is possible to right the wrongs of your life. Whether you've been wronged--or have wronged others--he makes it possible to experience the freedom of forgiveness and the restoration of a clear conscience. - Publisher Erwin Lutzer's book helped thousands grasp the healing power of forgiveness. Now on DVD, the message is even simpler to apply in real life situations. But what if justice is not possible? Or if it doesn't undo the damage done? In this DVD series of lessons, noted pastor and author Erwin Lutzer carefully illustrates how it is possible to right the wrongs of your life. Whether you've been wronged--or have wronged others--he makes it possible to experience the freedom of forgiveness and the restoration of a clear conscience. 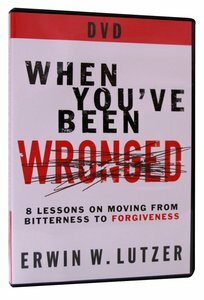 About "When You've Been Wronged"
Erwin Lutzer's book helped thousands grasp the healing power of forgiveness. Now on DVD, the message is even simpler to apply in real life situations.